If you were lucky enough to be educated in the 18th century, Classical Studies would have featured heavily in the curriculum. Most modern-day readers of this volume of Arrian’s (1st cent. AD) Anabasis of Alexander the Great’s conquests (4th cent. BC) would have to resort to Google to decipher the imagery in the frontispiece. Victory, personified, stands upon the peoples Alexander has vanquished – the Persians, the Egyptians, the Punjabis. The scene in the distance represents his Siege of Tyre, now in Turkey. Alexander, a military genius, built a mole or pier upon which to stand his siege towers. He breached the heavily fortified walls of the castle built on the island and conquered the city-state – ‘Tyre was his [military] masterpiece’ (Cartledge, 2004). 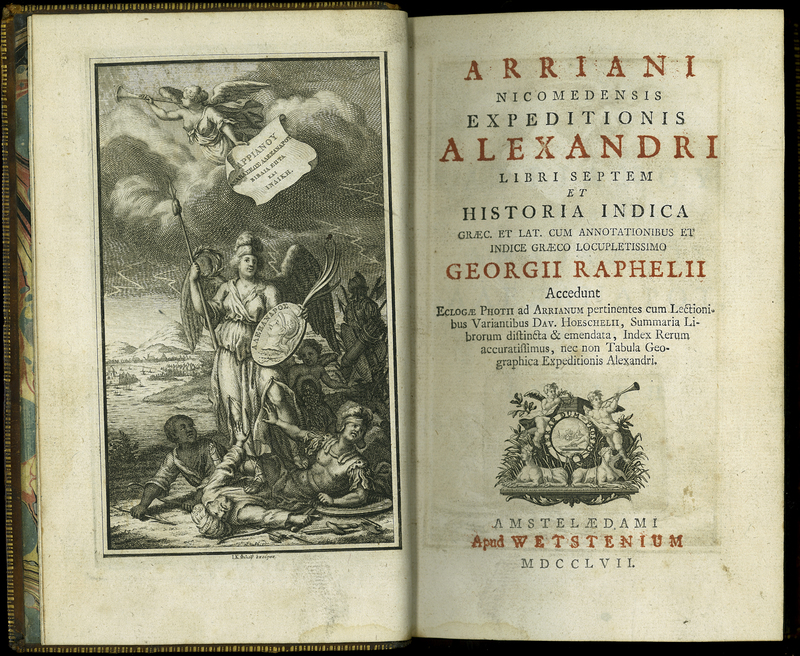 [Arrian of Nicomedia], “Arriani Nicomedensis Expeditionis Alexandri Libri Septem et Historica Indica,” ourheritage.ac.nz | OUR Heritage, accessed April 20, 2019, http://ourheritage.ac.nz/items/show/10678.